A call to action: your fat friend is going it alone. 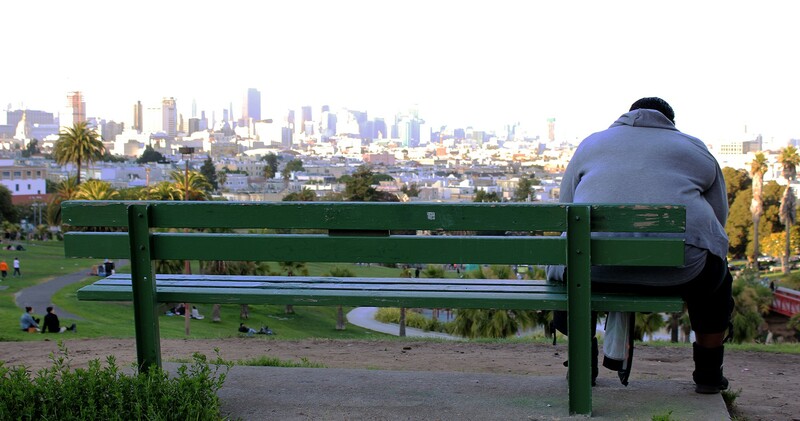 “Fat & Alone at Dolores Park,” Danyaal Rangwala. I first read about Errol Narvaez at the end of a draining week. Fatigue had sunk into my bones, and I felt weakened, made pliable by stress. I had taken a rare day off to spend some time in one of my favorite state parks. After a long hike, I stopped by a favorite cafe in a neighboring town. A beautiful young woman sat near the counter. Her shiny black hair fell in sheets over her crisp houndstooth jacket. She was striking, all contrast and vibrance in the afternoon light. She was happily talking with her companion when her sparkling eyes turned to me, where they stayed and slowly turned cold. She watched as I walked to the counter, watched as I stood in line, watched as I waited, watched as I ate my food, watched as I left. She fell silent, staring openly, unresponsive when I returned her gaze. A iciness gathered in her. I smiled, hoping to fend off chill with warmth. I have become accustomed to stares. As a fat person, you learn to ignore, disregard, joke about them, but they’re difficult to ignore completely. The challenge is in distinguishing whether or not a stare will mutate into action, interaction, harassment, violence. Hers was cold, stormy. Was it the overcast of an ordinary rainy day, or the gathering clouds of a hurricane? Would my day be grey, limp and lifeless, color drained from the sky and muted on the ground? Or would I spend the day rebuilding from the wreckage of an unexpected squall? Errol Narvaez was carried away in a flood. He was traveling home after a weekend in Las Vegas when his seat disappeared. Errol, like me, is fat, and flying is a gauntlet, a decathlon. He lived through one of my greatest fears: he was ejected from a plane. 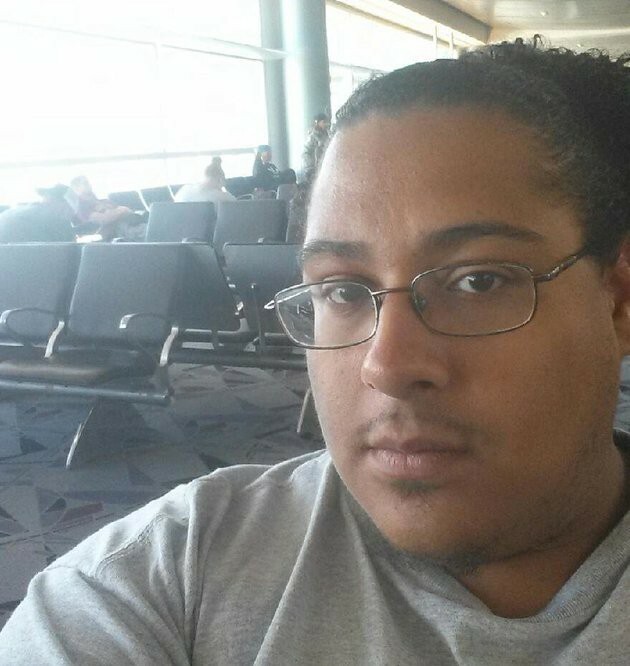 The airline moved Errol’s reserved aisle seat to a center seat — hellish for a fat person. When his seatmate complained, Errol was escorted off the plane past thirty-six rows of watchful faces. “You don’t know what it’s like, having to walk up the whole plane — Row 36, 35, 34,” he told reporters. When I read about what happened to Errol, anger, hurt and frustration welled up. Normally warm and outgoing, I found myself caught in an undertow of powerlessness, exasperation and familiarity. When I traveled to see family for the holidays, a thin couple sat a few feet away at the gate. They stared openly, whispering to one another while they looked my body up and down, over and over again. A few years earlier, a fellow passenger had asked to be re-seated when faced with the prospect of sitting next to me. As I read what Errol had gone through, my heart pounded. It could have been me. Errol’s story is a powerful reminder of all the ways the world is set up to exclude and shame fat people. United Airlines, like nearly all major airlines, has a policy to eject fat passengers from their flights. Flight attendants enforced that policy when the rest of the passengers were seated, an audience in a confined theater, watching a fat person try, and fail, simply to get home unnoticed. The ticket agent rebooked his flight for 2:00 am arrival and tried to charge him $117 for a six-hour delay, a sleepless night and the privilege of public humiliation. Apologies were foregone. Common courtesies were abandoned. Errol Narvaez was never treated as a passenger. To the airline, he was cumbersome, inconvenient cargo, inanimate and in the way. I discussed his story with friends. Most were outraged by Narvaez’s seat mate. Who would be so cold, so callous? Some were surprised by the ticket agent, charging a passenger for implementing the airline’s policy. A few turned their attention to the policy itself, which excludes fat people categorically. At every turn, it seems, Errol was ignored and insulted. What stood out to me was a sad, familiar realization: no one stood up for him. Hundreds of people watched Errol Narvaez endure public humiliation — as he put it, a “walk of shame” past each one of them — and not one person spoke up. Being fat requires a bottomless well of forgiveness. In the face of moments like these, many fat people move on silently, head held high, mouth held shut. But it stays with us. We have to make a calculated decision, as I did with the woman at the cafe: do we meet them with a smile? Or do we take a risk, staking some small claim to our dignity and wellbeing, and resist? Because we know, at the end of the day, that if we resist, we resist alone. When I tell people about stories like Errol’s, many scramble to defend the actions of the airline, the flight attendant, the seatmate, even the doctor who refused to treat a fat patient, the stranger who shouted “fatass!” on the street. What were you wearing? What did you say? They might have been having a bad day. It’s probably not their decision. They probably didn’t mean it. And they’re right. Most people don’t intend to do harm. But living in a culture that so reviles and rejects fat people means that we all internalize heavy, harsh judgments. Over time, they begin to feel like our own beliefs. Their stale lines begin to sound like our own voice. Others, when hearing about mistreatment of fat people, turn the focus back on the fat person. You’ve just got to have the right attitude. Don’t let the bastards get you down. You need a better body image. Change your mindset, and you can do anything. No matter the circumstances, no matter the evidence, the fat person is to blame. What they don’t understand is the degree to which fat people are able to do emotional jiu jitsu. We can withstand almost anything. These comments — just put a smile on your face and know they’re wrong — disregard the degree to which we already do. Being a fat person requires a generosity of spirit at all times, under all circumstances. Fat people can be astonishingly tough, emotionally strong, resilient people. Many of us have been hardened by daily indignities, sidelong glances, implicit and explicit exclusion. We know how to brush it off. Sometimes brushing it off is all we have. But once in a great while, that generosity and patience wears thin. Because it’s exhausting to have to make the case every day that those around you should treat you like a person. Sometimes that fatigue curdles into anger. That anger bubbles and foams from years’ worth of harassment, rejection, humiliation. The anger usually sours around the time that something big, something harsh happens — something like what happened to Errol Narvaez. It shook me to face such overt aggression. The simple act of walking down the street in a fat body had called up such rage and indignation in a perfect stranger. I was flustered, hurt and angry. And in a sea of people, I was entirely alone. In those moments, hearing thin friends talk about body image or attitude or self-esteem amplifies all that isolation. It stings, because it feels like a fundamental misunderstanding of what’s just happened. It contorts responsibility, laying blame for others’ behavior at our feet. I‘m sorry you don’t have better self-esteem is not the same as you shouldn’t be treated terribly. It’s a vicious kind of gaslighting that blames the prey for its predator’s violence. And, at this point, it’s ubiquitous. Because, as a culture, we only know how to blame fat people. We do not know how to love fat people. We do not know how to support fat people. We do not know how to act in solidarity with fat people. Exhaustion turns to frustration, frustration to anger. The anger curdles because poor treatment is so commonplace, and no one helps. It’s astonishingly rare to see a thin person intervene in the kind of commonplace bullying of fat people that happens. Even rarer to see a non-fat person say something proactively about accepting fat people. I can understand why. Some think poor treatment of fat people is warranted: if fat people don’t want to be shamed, rejected, excluded, they should just lose weight. Poor treatment is the price of admission for having the body you have. Others become uncomfortable when they see a type of behavior they wouldn’t otherwise tolerate. They shrink back, feeling a knot in their stomach as they witness something harsh and unwarranted — something they wouldn’t otherwise tolerate. And what would they even say? And who would back them up? It’s unnerving to witness, and isolating to interrupt. But that isolation, dear friend, is where fat people live every day. When we decide to stand up for ourselves, we are deciding to go it alone. We make little calculations every day. How much can I endure today? How much backlash can I withstand if I defend myself? What do I risk if I stand up for myself with my boss, partner, mother, friend? How can I ignore this, and will it still haunt me anyway? We go it alone because even our dearest friends, our most loving family, can’t comprehend defending a fat person without caveats, excuses, or qualifiers. Many don’t defend us at all. The silent, watchful passengers on Errol Narvaez’s flight aren’t the exception. They’re the rule. When I hear a story like Errol’s, I feel it, too. I feel it happen to me. The flush of shame. The hummingbird heartbeat. The tingling, crawling skin; the teary eyes; the sharp ache of powerlessness. A routine grief washes over me. I feel myself wrestling with the exhausting, familiar questions about how to respond. That’s when I remember just how alone I am. These little indignities and big assaults happen often. Over time, the faces of the aggressors have begun to blur together, a morass of worthless causes. What stays with me most are the faces — some stunned, some complacent — of the people who don’t intervene. Among them are dear friends, partners, colleagues, neighbors, family — good people with strong values. Their actions are rooted in honesty, compassion, respect and love. I’ve seen them take risks to stand up to injustices and improprieties. They don’t shy away from a challenge. They know what’s right, and they defend against what’s not. But when they see fat people being mistreated, they freeze. Maybe it’s because the risk feels too big. Maybe they don’t know what to say. Maybe they genuinely don’t notice. Whatever the reason, they don’t intervene. And when they stay silent, I am still alone. I am stuck, I am reeling, and I am alone. I would love to hear their voices saying something, anything, when someone passes judgment on fat people. I would love to hear them ask friends to stop offering unsolicited diet advice. I long to see one of them share Errol Narvaez’s story. Anything to interrupt the thick, toxic smog of attitudes and actions aimed at fat people. Please, dear friend, do something now. Say something to affirm a fat person. Post something on facebook. Break the isolation. Go out on a limb. Feel the way it sways and cracks beneath you. Remember that some of us feel that unsettling sway every day. Be the person that Errol Narvaez needed: the person with the courage to say that something wrong had happened. The person with the strength to stop it, even for a moment. Be the friend I needed on that street corner, who could share the burden of standing up to an unchecked bully. Be the bystander who won’t stand by. Think of the fat people you love and take a risk. Join us for a moment where we live every day. We need you urgently. Like this piece? There are more like it, including What it’s like to be that fat person next to you on the plane and On your concern for your fat friend’s health.